A client that manufactures adhesive and coating equipment for the electronics and semiconductor industries asked NOVO to design a custom silicon wafer coating system to apply a UV cure adhesive to one surface of a 300mm wafer. The system comprised three attached stations serviced by a conveyor: loading, coating, and curing. NOVO took responsibility for equipment qualification and process validation. 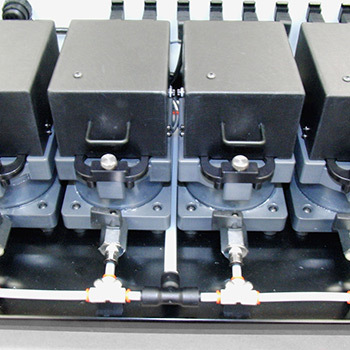 The material-handling subsystem consisted of a custom spinner with a vacuum chuck mounted on a linear positioning system. A passive centering mechanism referenced to the conveyor home position centered the wafer before vacuum was applied and the wafer was accelerated to the programmed angular velocity. 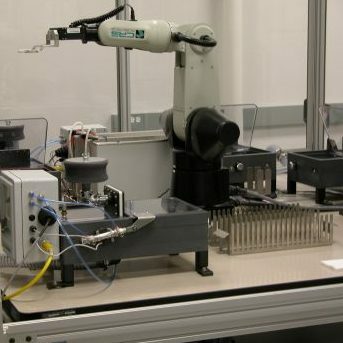 The spinning wafer was then advanced to the coating station, where a vision system determined the axis of rotation of the wafer, and the adhesive dispense head was automatically aligned with this axis. 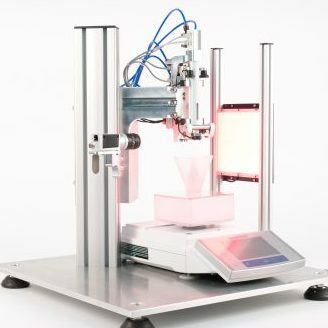 The z-height of the dispense head was adjusted based on input from a sensor that located the wafer surface. 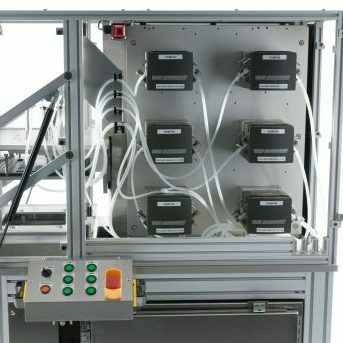 The dispense head was equipped with an auxiliary system that allowed aerosolization of the adhesive to be programmatically specified, which allowed the option of spin-coating or spray-coating. 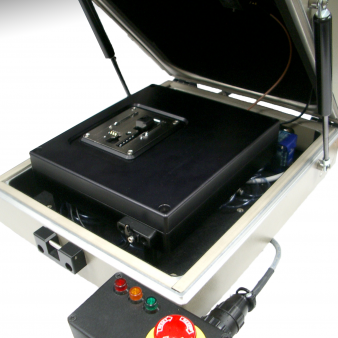 Before the coating process was initiated, spray shields and compartment doors were automatically deployed to eliminate overspray contamination of adjacent stations, the conveyor, and the spinner. Once the UV-cure adhesive has been applied, the wafer is advanced into the curing station, which is a carefully designed UV oven optimized to provide uniform intensity over the wafer surface. The rotational velocity is adjusted, the compartment access doors are closed so that the compartment is effectively light-tight, and the curing cycle begins. At the completion of the curing cycle, the wafer is returned to the load/unload station for operator retrieval. The controls architecture was modular; each station was controlled by a separate station controller, and the stations were sequenced by a central PLC controller, which also serviced the touch-screen UI. 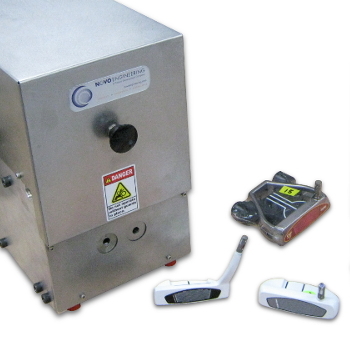 Sensors, limit switches, and interlocks were arranged to protect the valuable wafers and to ensure operator safety. SEMI S2 and S8 standards were adhered to. From conceptual design to delivery, this prototype was successfully completed in about three months. The system met not only the functional requirements, but also matched the industrial design, fit, and finish quality of their production systems. The client was pleased that NOVO was flexible enough to operate autonomously when appropriate, but could also incorporate their concurrent design and process inputs and leverage applicable existing design elements.